Researchers at Fermilab are taking cues from industry to improve their own “big data” processing challenges. Machine learning is revolutionizing data analysis across academia and industries and is having an impact on our daily lives. Recent leaps in driverless car navigation and the voice recognition features of personal assistants are possible because of this form of artificial intelligence. As data sets in the Information Age continue to grow, companies such as Google and Microsoft are building tools that make machine learning faster and more efficient. Data sets in particle physics are growing at unprecedented rates as accelerators are upgraded to higher performance and detectors become more fine-grained and complex. More sophisticated methods for analyzing these large data sets that also avoid losses in computing efficiency are required. 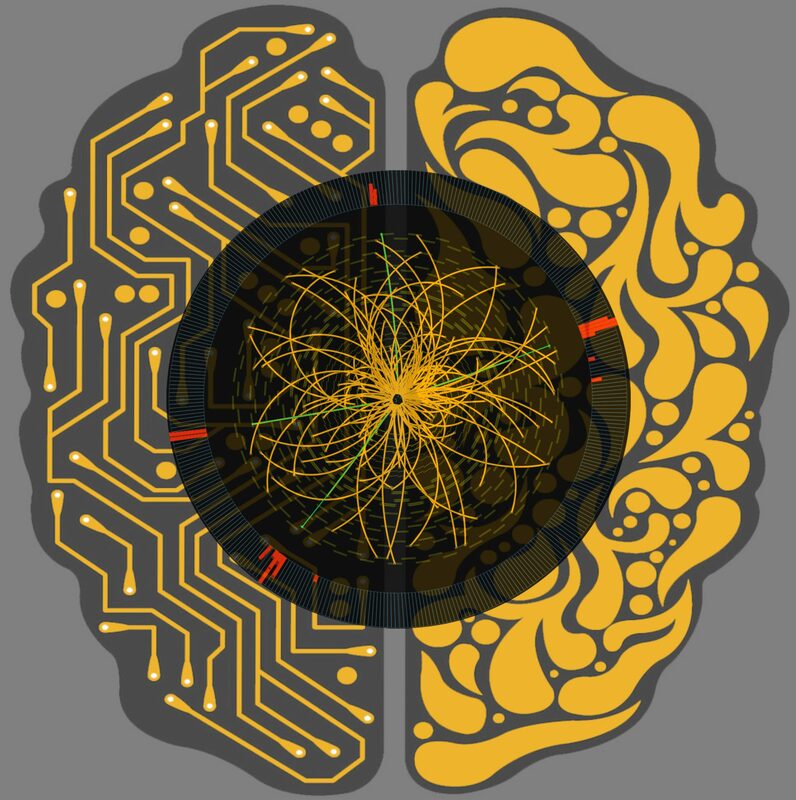 For well over two decades, machine learning has already proven to be useful in a wide range of particle physics applications. In particle physics lingo, a trigger occurs when a series of electronics and algorithms are used to select which collisions are recorded and which are discarded. Fermilab scientists are exploring a new approach that uses high-throughput, low-latency programmable microchips called field programmable gate arrays (FPGAs). The trigger algorithms have to operate in a daunting environment, which requires them to process events at the collision rate of 40 MHz at the Large Hadron Collider (LHC) and complete it in as little as hundreds of nanoseconds. In a growing collaboration with CERN, MIT, University of Florida, University of Illinois at Chicago and other institutions, Fermilab researchers have recently developed a software tool, called hls4ml, that helps users implement their own custom machine learning algorithms on FPGAs. hls4ml translates industry-standard machine learning algorithms, such as Keras, TensorFlow and PyTorch, into instructions for the FPGA, called firmware. This tool leverages a new way to create firmware called high-level synthesis (HLS), which is similar to writing standard software and reduces development time. hls4ml also allows users to take advantage of the capabilities of FPGAs to speed up computations, such as the ability to do many multiplications in parallel with reduced (but sufficient) precision. The first proof-of-concept implementation of the tool showed that a neural network with over 100 hidden neurons could classify jets originating from different particles, such as quarks, gluons, W bosons, Z bosons or top quarks, in under 75 nanoseconds. Neural networks can also be used for iterative tasks, such as determining the momentum of a muon passing through the CMS endcap detectors. Using hls4ml, CMS collaborators have shown that the ability to reject fake muons was up to 80 percent better than previous methods. Ultrafast, low-latency machine learning inference in FPGA hardware has much broader implications. Beyond real-time LHC data processing, applications can be found in neutrino and dark matter experiments and particle accelerator beamline controls. Even more broadly, accelerating machine learning with specialized hardware such as FPGAs and dedicated circuits called ASICs (application-specific integrated circuits) is an area of active development for large-scale computing challenges. Industry drivers such as Amazon Web Services with Xilinx FPGAs, Microsoft Azure and Intel have invested heavily in FPGAs, while Google has developed its own ASIC (a tensor processing unit, TPU). Specialized hardware platforms coupled with CPUs, referred to as co-processors, are driving the heterogeneous computing revolution. hls4ml can be applied in such co-processor platforms. Combining heterogeneous computing and hls4ML for low-latency machine learning inference could lead to an exciting potential to solve future computing challenges in particle physics. The authors are members of the Fermilab CMS Department.